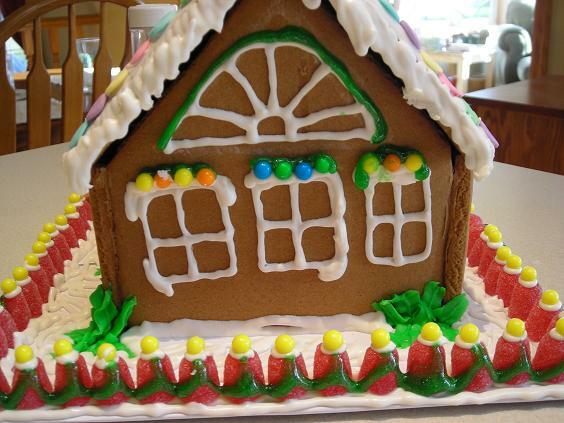 Kate in the Kitchen — What are the foreclosure rules on a Gingerbread house? 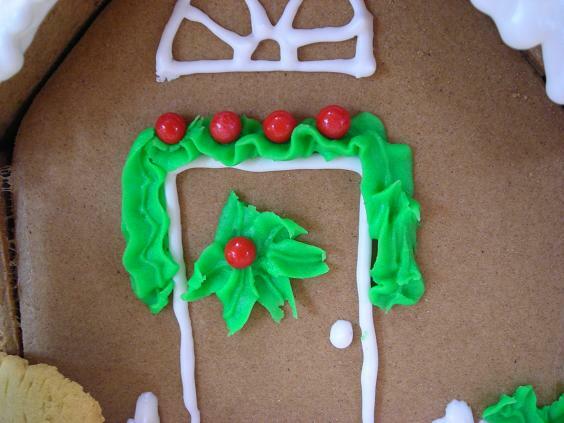 What are the foreclosure rules on a Gingerbread house? If I even begin to think, talk or silently debate about doing one of these next year, somebody smack me and duct tape my arms down until I come to my senses. But, that being said and with the fresh memory of just exactly how long this whole procedure took, the end result couldn’t help but charm the smile right out of me. It’s pretty darn cute. 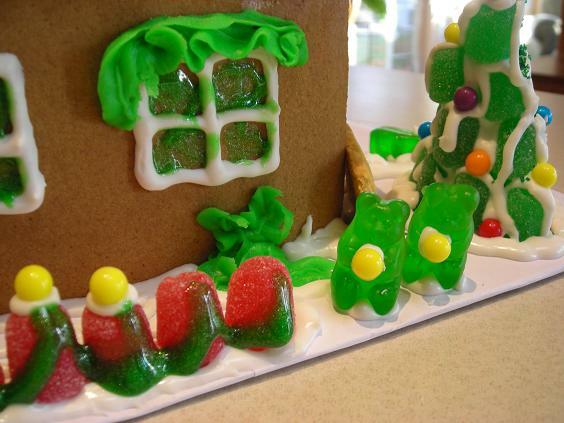 Today, in the food-centric month of November, it’s National Gingerbread House Day. It’s also National Vanilla Cupcake Day and I had every intention of making a delicious batch of cupcakes to celebrate but then this house took over my life and squeezed all the motivation out of me over, oh….about six and a half hours. I tried to be sour about the effort and time, but then something happened……. 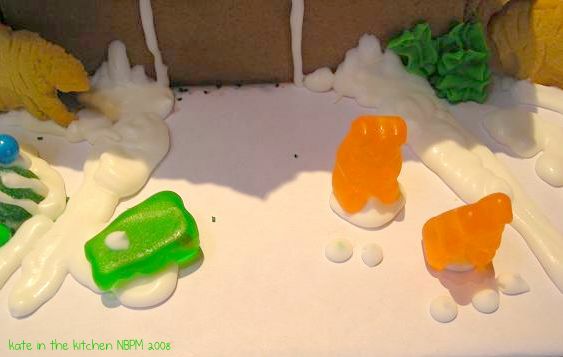 I couldn’t help but smile at the snowball fight antics of the gummy bears, those mischevious little things. Or appreciate the snow covered Christmas tree in the front yard. The bears have done such a wonderful job hanging lights and garlands around the house. And the fence was so pretty and festive…..they were just finishing it up too. 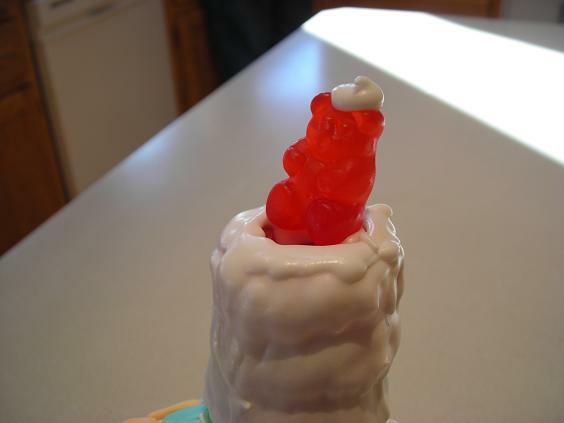 And Santa Gummy Bear was lurking on the chimney! So I tried to be all Grinchy about the effort, the time and the frustration involved in trying to piece together lopsided pre-formed gingerbread pieces with angles that were all off-center and not straight, but really, like childbirth, the final effort was worth all the agony. It is really, really darn cute. It wasn’t until I started in on the pieces of the ‘ready to decorate’ kit- a colossal lie if I ever read one- that I recalled reading far too much about them on other blog sites last year (and the year before if I really want to admit it) that said these kits were extremely difficult to work with. The intentions are good, absolutely, but it just doesn’t have the ease that one is lead to believe. In my kit, the two side pieces were warped, and no amount of shaping could save them. This meant that every piece that was supposed to attach to them wouldn’t fit either. Maybe they aren’t all as bad as this one; I could hope anyway. While I have a large perfectionist streak that led me to work probably way too long on this to be successful, I think someone with less patience would have given up at first sight. Once I was done with the forming of the house, the last thing I wanted to do was futz with any decorations, in fact, all I wanted was a stiff drink. The only thought that kept me from chucking the lopsided thing in the trash was the recurring mantra ‘It will definitely look better once I decorate it!! !’ and so I sat down with ‘NCIS’ because Mark Harmon can cure any ill-will with those blue eyes, even at his advanced age, and also with my knitting- the finest brain silencer I have ever known- and well, by the time ‘Numb3rs’ came on, the ‘house from hell’ was nearly forgotten. So FAIR WARNING– skip the kits and find a decent recipe and guide to make a house from scratch, that is, if you truly want to do this. It also works to use graham crackers. I had my cake decorating skills from culinary school to support me, and the tools to make it all work, like piping bags and decorating tips. Even given all that, this may be the only gingerbread house I ever make. Thank goodness I have no plans to eat it so it can sit around and be admired until after Christmas when I can stand 10 feet from the open trash can and launch it inside, ceremoniously and with glee. Snort! 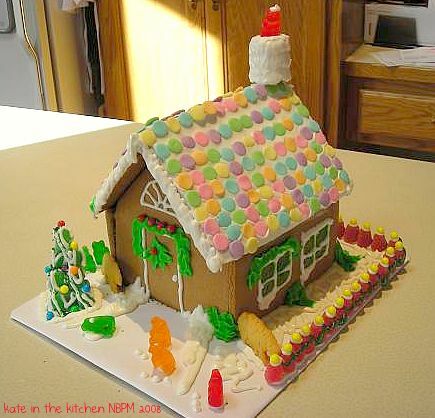 That’s a wonderful title and an equally wonderful gingerbread house! Yes, animal crackers- polar bears to be exact. I didn’t place them as fence gates, but that’s kind of what they are, yes. Green gumdrops- and red on the fence. Thank goodness for Brachs holiday designs! I didn’t have to sort through the bulk bin for those two colors- there was a whole bin of just green and red. The colored balls came with the kit- they’re just little sugar bombs but oh so cute! Perfect Christmas lights! Oh Katiekins, I love this! I laughed my head off at the sarcastic descriptions. The snowball fight, the bears “finishing” the fence, the santa on the chimney, all adorable! 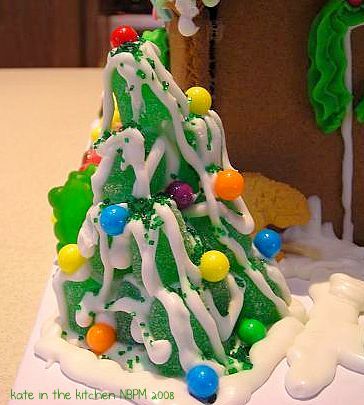 It took me a while to figure out the tree is green gumdrops, but what are the colored balls – jawbreakers?? And the fence gates – are they animal crackers? or am I imagining things? It looks great, cant wait to see it at Thanksgiving! I can see where littler kids would be bored with this; Griffin made one when he was about 8 or 9, doing the graham cracker deal and it was adorable. He wasn’t home to help me this time, but has been admiring the results greatly AND eyeing the leftover candy! Last year, I clearly remember settling in to make my first Gingerbread house. I thought it would be such a fun activity for the kids and I. Little did I know, that before we even got through the first step the kids would lose interest (especially since I wasn’t letting them eat the candy) and my little experiment would turn into a house that looked as if it was hit by a humonsterous tornado. It was a disaster and I say never again. You, did a darling job! I can only imagine the patience this took. Way to go – and love that snowball fight! Hilarious! I’ll try to answer your questions based on what I did and what I think would be easier. Find a sturdy piece of cardboard for the base that is large enough to accommodate the house dimensions and with room to accessorize with decorations without crowding. Don’t use a cereal box as I think it would be too flimsy- you want tough corrugated cardboard. I covered mine with white paper to make it look like snow. The pieces are anchored to the box, generally with icing, but I used glue as I knew I wouldn’t be eating it. Elmers was my choice but I think it could have been more industrial in strength. As you form the pieces and attach them to the base, you can use 14-oz sized cans to stabilize the pieces until they are set. Lay the sides first and allow to set before applying the roof. Save ALL decorating until the house is firmly applied and dried to the base. You will be touching the house pieces constantly, and if you put on any decorations, you’ll wreck them. I did the house on a Friday evening, and finished the decorations on Sunday. For the icing, what you get in the kit is decorator icing that dries rock hard. Don’t use buttercream or it won’t set and you will likely have a mess on your hands. Craft stores, some of them anyway, carry pre-made bags of decorator icing; all you do is add water and mix it for about 5 minutes. It needs to be kept covered with a wet towel while you work and cannot be chilled or it will harden beyond saving. Mix it up and use it immediately. If you can’t find it pre-made in a store, check Google, searching for a recipe. I imagine you will find plenty. I believe the icing is made from powdered sugar with a little cornstarch added but I don’t have a recipe myself. You can separate out portions of it and use food color to make any changes. I just bought a tube of green icing and squeezed some into a piping bag with a leaf tip to make my green decorations. So, the kid wants to make one. I once bought a “cookie house” kit, but it was overpriced ($15 for about $2 worth of cookies and frosting) so I returned it. Therefore, I’m leaning towards flying solo. First, do you use a cardboard/boxboard/ceral box to hold it up from the inside? and is it anchored to the box w/ frosting? what is a good receipe for “anchor/glue frosting”? do you draw the windows/details before assembling, or get it standing and then draw the windows/doors? PS I am going to suggest you become friends with my food loving daughter to add a little outside (junior highschool) influence to her life. She watches the cooking channel and food/maching infomercials over other things. Mmmmm…. somethings good is brewing in her kitchen!